The rapidly growing world of digital information is necessitating the development of effective information strategies and information management. 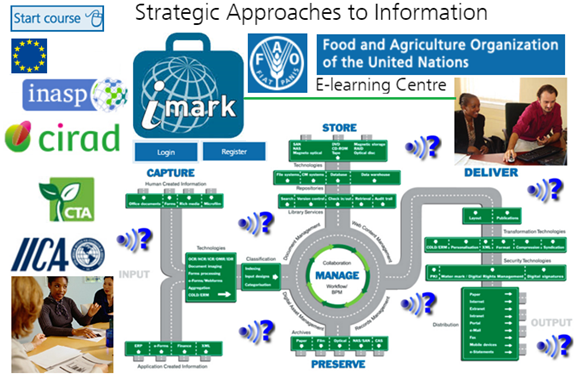 By taking a free FAO IMARK E-learning course ‘Strategic Approaches to Information’ you will learn how to think strategically about information development, management, dissemination and communication. The European Union (EU) has sustained the development and dissemination of free e-learning by FAO to meet the needs of professionals working in food and nutrition security, social and economic development and sustainable management of natural resources world-wide. The contribution of the EU to all courses available on the FAO’s site is 80%. The EU is also supporting the development of the e-learning interface used for all the courses, and the migration towards newer technologies. Since the first course - launched by FAO in 2005 - FAO has reached over 375,000 e-learners. From the inception of all aspects of a new course to its distribution in multiple languages (ensuring the latest terms) FAO involves a number of partners (like-minded institutions, subject matter experts, courseware developers). 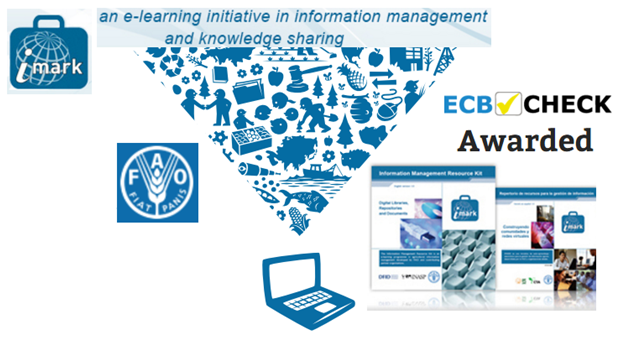 To produce and deliver e-learning content, FAO and its partners have developed and adopted the Information Management Resource Kit (IMARK) work flow - an e-learning initiative to train individuals and support institutions and networks world-wide in the effective management of information. IMARK covers several major subject areas in agricultural information management in order to respond to the needs of information professionals. IMARK seeks to provide an interactive self-paced learning environment addressing each area in which information professionals can learn new concepts, approaches and attitudes for effective information management. All e-learning modules - covering a wealth of topics of global interest - are being developed using the latest methods in e-learning, providing an interactive environment for self-paced learning. The quality of all e-learning courses is guaranteed by the ECBCheck quality criteria scheme. Online, downloadable and CD-Rom versions of all the courses offer content for self-pace learning as well as materials for trainers and references to existing bibliography and online resources. Curious to try a lesson? To get a quick sample of what is on offer, try a demo lesson of one of the following courses: Climate Change and Food Security - - Communicating for Food Security - - Social Media for Development. Or just LOGIN / REGISTER for free access to all courses! Are you a Policymaker, Senior Manager, Information Manager or a Trainer working in governmental and non-governmental (international) organization(s), academic and research institution(s), documentation, publishing, and IT center(s)? 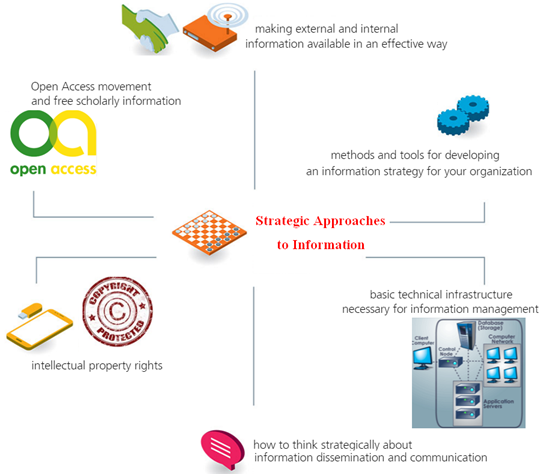 Are you simply searching for effective information management strategies, including methods, tools, technical infrastructure, intellectual property rights, Open Access etc.? (stresses the need for the development of of information strategies and effective information management). (presents tools, resources, approaches and stages involved in planning and developing an information strategy). (introduces possible management interventions to prioritize actions and minimize the costs of making information available). (shows how to identify and prioritize audience(s), as well as the relationship between audience, content, format, media, services)). (presents organizational structure and the basic technical infrastructure necessary for information management in an organization; introduces the concepts of intellectual property rights (IPR); focuses on the Open Research / Open Access movement). The French agricultural research and international cooperation organization CIRAD, the Technical Centre for Agricultural and Rural Cooperation CTA, the Inter-American Institute for Cooperation on Agriculture IICA, an international development charity INASP have been involved in the development of the present course. Here you can check out frequently asked questions regarding e-learning services provided by FAO.